A rendering of the main entrance of the forthcoming new Auckland International Airport Hotel. 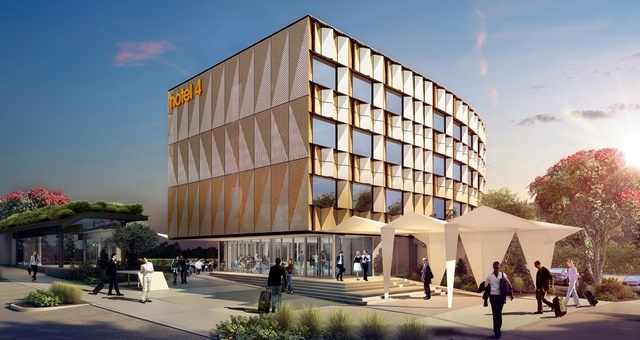 Development is underway on a new four-star hotel at Auckland International Airport in New Zealand, with Dalman Architects signed to oversee the projects. The 146-room hotel is being constructed out of a gutted office building which is being stripped bare and extended with an additional floor and extensions at both ends. The building was previously used as part of a retail and business district managed by Auckland International Airport. Public facilities at the new hotel will include a restaurant and bar, with a Pacific island theme and colour scheme to be applied to the new property. It is due for completion and opening to the public in 2020. Project Architect Michael Pepper said the curved hotel design will be clad in perforated bronze assembled in a variegated sequence. “We are delighted to be working with AIAL as lead consultants and BIM managers on the project. The refurbishment will offer business and leisure travellers an attractive accommodation option with the convenience of being at the airport,” Dalman Architects Managing Director Richard Dalman added.